It’s no secret that residents of Shelby love sports! The folks around here work hard and play just as hard, whether it’s football, baseball, basketball, or the numerous other high-impact sports that can cause harm to your family’s mouths. In fact, at least 13% of all oral injuries happen during sports activities. Dr. Marissa Miller wants you to know how keep your teeth out of harm’s way and still enjoy a good game, so please read on and learn how to win big with a safe, healthy smile. We know what you’re thinking, mouth guards are the key to staying safe on the field, right? Yes, they are a big part of it, but it takes more than just a mouth guard to keep your kids from getting a chipped tooth while scoring a touchdown. Sports safety for oral health means getting the right mouth guard and wearing it the right way. After all, the best defense is a good offense! Mouth guards are effective in every contact sport, but they are required by schools for football, ice hockey, field hockey, and lacrosse. However, basketball and baseball have the highest incidence rate of dental injuries. The American Dental Association actually recommends mouth guards for 29 sports! These include everything from martial arts, to gymnastics, to equestrian events, to skateboarding. 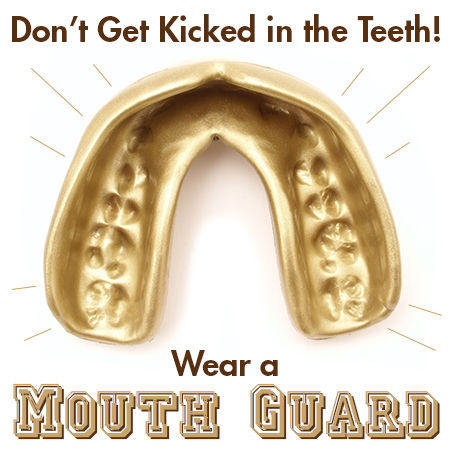 A good rule of thumb to follow is, when in doubt get a mouth guard! Better safe than sorry. Athletes without mouth protectors are 60 times more likely to incur an injury to the teeth. According to the American Dental Association, mouth guards are effective because they create a buffer that helps protect teeth, gums, cheeks, and tongues from impact. They may also play a role in preventing and/or limiting damage from concussions. There are three different kinds of mouth protectors available – stock, boil and bite, and custom-fit. Stock mouth guards are the least expensive and the easiest to find, but they offer no customization, and can cause irritation and even fall out during sports activities. Boil and bite mouth protectors are made of a special plastic that becomes malleable when boiled, and can then be fitted. Dr. Miller and the American Dental Association recommend custom-fit mouth guards because they are the highest quality option with the best protection and comfort. At Discovery Dental, using a special impression of your teeth, we will create a perfectly fitted, custom mouth protector. This is the most expensive option, but it is the only one that offers comprehensive oral safety during sports. How are Mouth Guards Used? First thing’s first, make sure to wear it during all sports activities, including practice, scrimmages, and games. After each use, clean the mouth guard with a toothbrush and toothpaste. It should also be cleaned occasionally with soap and water. Store the mouth guard in a ventilated container, and never leave it in direct sunlight. How else can you keep your mouth safe? The most important thing is to know which activities pose a risk, and be prepared with a mouth guard, helmet, and whatever protections are necessary. Dr. Marissa Miller wants all Shelby residents to enjoy the game without fearing for their teeth, so give us a call at Discovery Dental today at 419-342‑4217 with any questions!